Seasonal cottage. Woodstove only source of heat in cool weather. 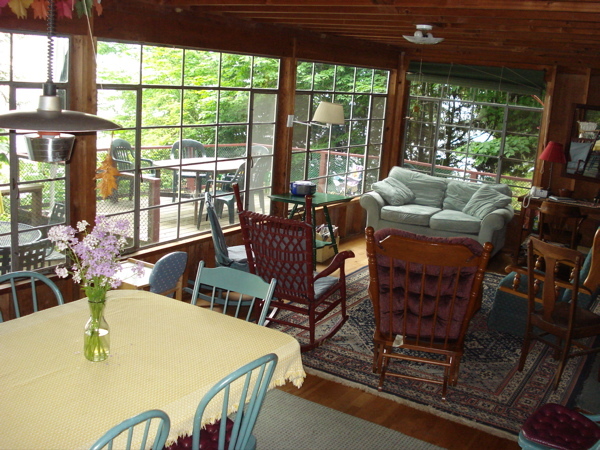 5 bedroom cottage, west side of Skaneateles Lake near Mandana. Owned by the Blakney sisters. Visit our website for availability and pricing. A classic 1950's family cottage experience, which remains very much like our Sweet sister ancestors created in the last century (except now we have high speed internet access). It's all about providing basic comforts for sometimes expanded groups, both outside and in, with full focus on the beauty of the ever changing lake and forest. It is a place of true retreat, semi-secluded, tranquil, and the lapping of the waves on the shore - sleep inducing. The main changes we have made are upgraded kitchen appliances and more fully equipped the kitchen, added a lovely second bathroom (with a lake view), a stacked washer & dryer, a larger parking area, and three generous deck levels stepping down through shaded trees to the 100' private beach frontage with dock and raft. The great aunts five bedrooms upstairs still sleep up to thirteen adults. There are one king, one queen, two doubles, a porta crib and five single beds. The Vermont Castings wood stove keeps us happy on chilly days and nights, and the outdoor gas barbecue eases kitchen duty in summer. A large extension table in the open plan living area, sits beside wrap around windows with full view of the lake and three outside tables on the top deck, providing ample dining in any weather.